Punxsutawney Phil saw his shadow Thursday, officials said, prompting a declaration of six more weeks of winter. The groundhog is seen here at the 2013 celebration at Gobbler's Knob in Punxsutawney, Pa.
As aficionados of the annual ritual will know, that means we're in for six more weeks of cold weather, and as the prediction was read out in in Punxsutawney Pa., a sign was held aloft reading, "We love Old Man Winter." But other groundhogs did not agree with Phil's assessment. In particular, Staten Island Chuck — owner of the highest accuracy rating (at 80 percent) among prognosticating rodents — informed a New York audience that we would see an early spring. And to the north in Nova Scotia, Shubenacadie Sam concurred with Chuck. We'll note that Sam seems to have the most polished media presence among his peers: When the door to his little house slid open this morning, he quickly emerged and sprinted across his snowy enclosure, delighting the crowd. It was the 131st time Punxsutawney Phil has shared his meteorological ideas with a grateful nation, and this time around, the information was hard-won. His eponymous day seemed to sneak up on Phil, and despite more than an hour of loud music and the adoring shouts of human admirers that preceded the sunrise event, his handlers had to grapple with the groundhog so he could have his moment in the sun (or shade). 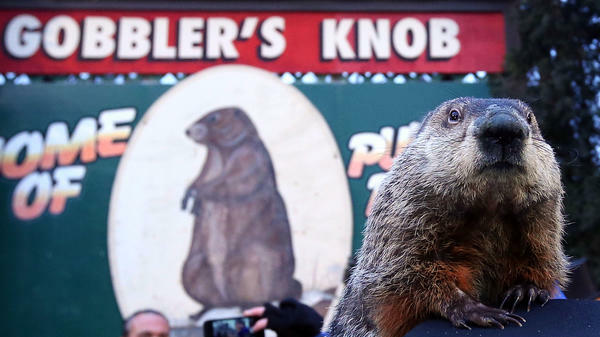 Phil's rambunctious behavior could be interpreted as a sign that he's connected to a larger animal collective conscious — one that might recall that in olden times, the Gobbler's Knob celebration included eating the star rodent, as NPR intern Cecilia Mazanec reports. "But as Phil rose in popularity, he moved off the menu," Cecilia notes. The event in Punxsutawney is a party, with officials wearing top hats onstage and many in the audience wearing groundhog hats made of brown fleece. For the record, it was around 30 degrees at the event this morning. To awaken the groundhog, the crowd chanted "Phil! Phil! Phil! Phil!" The door on his tree-trunk lair was unlocked. And then, on the count of three, his handlers (wearing protective gloves that they would sorely need) brought Phil out. "He's squealin', he's hollerin'!" the emcee said, before concluding, "Phil is feisty!" The animal, known in his hometown as "the seer of seers," was then displayed to the crowd before being placed on a stump to determine whether he might see his own shadow. An official decree was then read aloud, declaring our cold future. If you just like the movie Groundhog Day and don't know what the fuss is about, here's a video for you.